Another breakfast, another overload of toast and another damp morning with the promise of dryer weather to come. I'm tired already after all this riding so I'm pleased to hear the plan today is not huge mileage. Strontium today, then Mallaig for tea. Strontium is only a hop-skip-jump away from Fort William. Some of the lads take a walk into Fort William, just to do a little shopping and see what's what. I stay at the BnB to chill out, check the bike over and also to help the Landlady update some pictures on her website. I lay there on my bed for a while, enjoying the privacy and peace and quiet. I think to myself about just how tiring it is to ride hard and fast day after day. I think about how much I enjoy my own space. I also think about how sometimes I hate to be alone. I drift into a short and light sleep as I come to the conclusion it's all about balance. That hardest part is getting the balance right. I don't fall into a deep sleep, so I'm not bothered when SC, my roommate, enters the room with a handful of goodies and announces we'll be heading out shortly. So again, maybe a little later than usual, I start the familiar routine of gearing up. Knee pads, bike pants, boots, back protector, jacket, wallet, money, keys, helmet, gloves...anyone who's ridden a bike regularly will know their own routine. 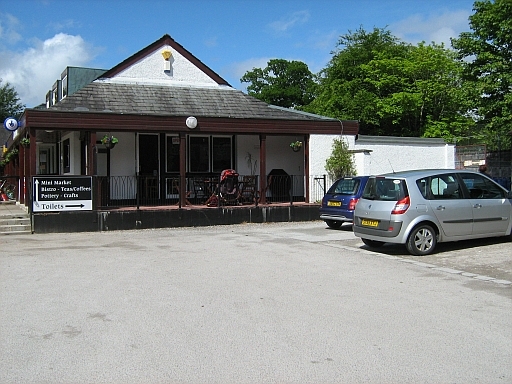 The Corran ferry is only 7 miles south of Fort William. It crosses the sea loch of Loch Linnhe and reduces the distance from Fort William to Strontium by 20 or 30 miles, and also eliminates a lot of single-track roads. The ferry is not a big thing, so it's quite a shock to see a huge lorry rolling down the waiting queue and park behind the bikes. We talk to the driver who tells us he has 24 tons of fish-food onboard and to hold on tight to the bikes as he boards! The ferry docks and we all ride on then brace ourselves as the juggernaut boards. Surprisingly there's not that much movement and I breathe a sigh of relief. The ferry crossing is short, so bikers remain on the bikes as they cross. It's a strange feeling sat still on the bike as we roll gently on the water. It's not scary or dangerous, just an unusual sensation. 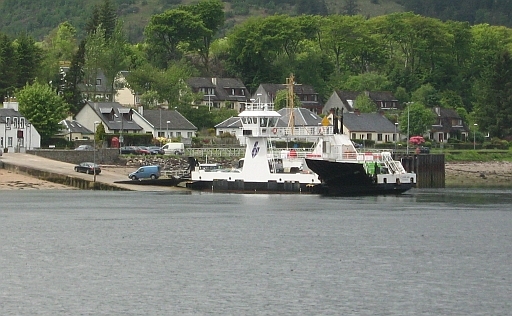 The Corran Ferry across Loch Linnhe to Strontium. It's not that big...but big enough for over 24 tons of lorry. The road to Strontium is another fast one. It's hardly exciting any more, another fast road. More open view bends, a few blind crests and sharper corners, a handful of fast straights, you're starting to get the picture now surely. Just before I enter Strontium I spot a police car, the first I've seen all week! It's a patrol car and I pass him all safe and legal, but BigD later tells me he seemed not too impressed when he went past. Probably his loud pipes I reckon. Strontium is not much of a place. Famous for having an element named after it I daresay most people will have heard of it, but judging by the quiet and peaceful nature of the place very few will have been. There are only a handful of houses with a village green. Next to the green and the village hall is a cafe...so by now it should come as no surprise that we're on the tea and cake again. I wonder if this is 8 go wild in Scotland or 8 drink tea and eat cakes in Scotland. What is much more manly is the road from Strontian to Lochailort. If you take time to check your map you'll see I'm talking of the A861, West then Northbound from Strontium. It's manly because it's single track, very twisty and full of terrible surprises. One minute you've the road to yourself, up down left right, right right up, down, right, up up left! Then I pop round a bend into the front of a very large coach. Of course the coach is jammed in the road so I have to back-pedal and give him room to pass. Down, up, up, left, right right, left left left, up up down up...whooooa! Now I'm into a Land Rover in a mad hurry to see me off the road. Onto the verge, into the gravel and stop with my knee trembling as I struggle to keep the bike upright. I'm in front. I know why. I learnt to ride on roads like this so I'm actually for once the fastest here. It's either that or the rest of the lads are letting me act as minesweeper. They'll know it's time to stop when they see me splatted like a bug on the front of another coach. Terrifying though it is, I'm enjoying the road. It's quite a disappointment as the road opens out and the lads roll past me one by one. For a short while there I was the man. Hey-ho, back to being the slow one at the back. Yesterday JR had spotted from the Armadale to Mallaig ferry, some beaches on the Mallaig side. 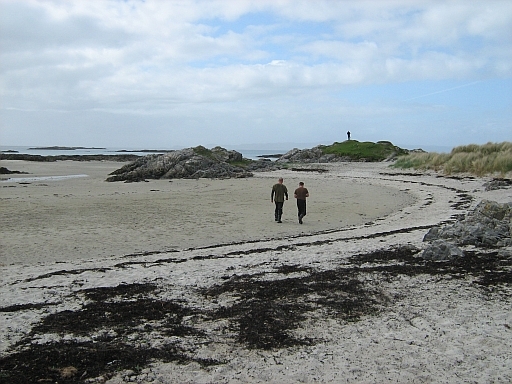 I told him these were the...er...famous white sands of Arisaig. Today he wantsto have a look at them. JR's not a man to upset so we all agree to follow myself, the slow boy, to these white beaches. I had stopped at one some 3 years earlier so it was up to me to keep JR happy. The only issue is that I can't really remember how to get there or where they are. I know there's a sign to Arisaig along the Mallaig road so that's my best chance of preventing a beating. I follow the sign for Arisaig. We are on the B8008. Nothing looks familiar and I start to sweat a little panic inside my already warm bike gear. I spot a sign saying coastal route and follow that...whilst making plans to run away at the next chance. Nothing looks familiar; nothing looks hopeful, just a tiny back road and a few desolate houses. The road then opens out and I can see coastline and a sprinkling of beaches between rock formations. In a blind desperate last chance attempt to save myself I turn off-road onto a track that leads beachwards. I'm partial to a little off road but I expect to get a beating for leading 7 lads on nice shiny sports bikes onto a dirt track. I'm not actually in any real physical danger you understand, but the moaning and mocking would be equally intolerable. It comes as a huge relief that only a hundred yards onto the track there's a campsite and a farmhouse. As we stop the bikes a young and rather buxom wench comes running out of some stables and yells "We're full!" A rude comment about her t-shirt also being full is muttered by someone whilst MW explains we're only coming to wander to the beach. I can see the relief on her face, after I take my eyes off her chest. She smiles and says we can buy an ice cream whilst we're here so we all pay our pound to watch her bend down into the freezer. I guess I've not seen the girlfriend for a while. White Sands at Invercaimbe Campsite. What a lucky find. The campsite, Invercaimbe Campsite, is only small and a handful of caravans later we're onto a beautiful beach. JR seems mightily impressed and praises me on my choice of stop. It seems I've avoided my metaphorical beating and mockery. We all spend some time taking pictures and walking across the sand. I take a moment alone to admire the view. I've seen the full length and breadth of this island, the island that's England, Scotland and Wales. There's nowhere quite like the North West of Scotland. It's the last remaining area where you can feel remote. Logic dictates I'm only yards from a campsite and a few miles from towns with shops, yet I can at least feel remote. 6 of our group are carrying on to Mallaig, for tea. I'm too tight to pay those prices there for a meal, so I decide to ride back to Fort William. SS decides to come with me too, he's not tight but not bothered about eating in Mallaig. We seperate at the main road and SS and I ride the "Road to the Isles" again at full pelt back into town. Back in Fort William I detour SS and myself onto the Glen Nevis road. If you ever are in Fort William on a bike, you must make this tiny detour. The road, rather boringly, leads past the Glen Nevis campsite and a pub or two and then opens out to a dead end a few miles later. After the last pub is where the fun begins. Imagine a rollercoaster made of tarmac, two lanes wide. There are other rollercoaster roads up here, but most are single track. This is two-track and very VERY twisty and up-and-downy. Over some crests if you're brave enough you take off, some corners are blind and some are just plain scary. Round one bend I come to a sharp stop. 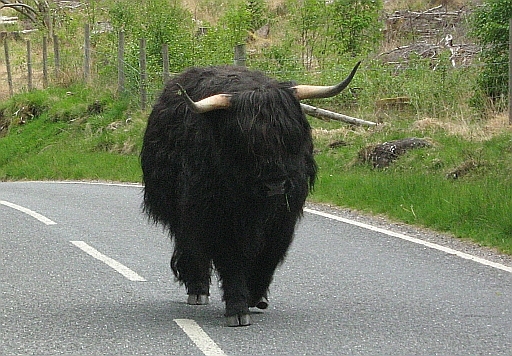 Facing me, cool as a cucumber, is a large black wooly cow, with horns. SS stops sharply behind me. The cow, or bull, I wasn't going to ask him or her, just looks at me and SS. His or her friend is by the side of the road, looking at us too. They are magnificent animals and I’m in awe...and fear. These creatures could easily panic and charge us. We sit there, quietly eyeing each other up. Eventually boredom overcomes the fear so I re-start the bike and very tentatively pass by the beasts before I crack open the throttle to get way. SS and I spend a brief 5 minutes at the end of the road taking pictures and smoking. We ride the rollercoaster back and sure enough the cows are still there. I don't stop this time but pass carefully, slowly and as wide as I can. The rest of the road makes me smile and I leave my stomach in the air then on the floor with each rise and fall and twist and turn. SS and I get a takeaway from Fort William and go back to the BnB. The lads return later and another evening passes as is now routine. I'm uploading pictures and watching the iPlayer on my laptop. Sometimes I go outside to talk to the rest of the lads then give up as the midges start to eat me alive again. Later SC and I watch some crap action film before we sleep again. I sure do miss the girlfriend at times like this. It's weird reading this and seeing you ride fast Ren. This site is all about being careful and sensible and then your risking getting splatted onto the front of a coach. Is it because your in Scotland or because your with a group of lads? Aaah, how much has changed in 7 years Garth. I was a little sillier back then 'tis true. I was riding with a bunch of lads who were all a lot faster than I too. I was in Scotland where the roads are most excellent. I struggle to "put over" the right balance. Motorcycling should be fun and exciting and thrilling but I also want to promote sensible and safe riding. I want people to keep to speed limits and be careful then I also want them to relish the excitement . Watching Sharon grow as a rider I can see she too enjoys opening the throttle and whooshing through a set of twisty bends and that makes me smile, then worry in case it all goes wrong. I hope that as I mature as a rider my choice of when to up the pace improves. There's nothing to be gained by splatting myself into the front of a coach.